My major issue is that I find all the maps rather 'unrealistic' = from the 'bridges to no-where' in 'Anthill' to the 'how did they get there ?' 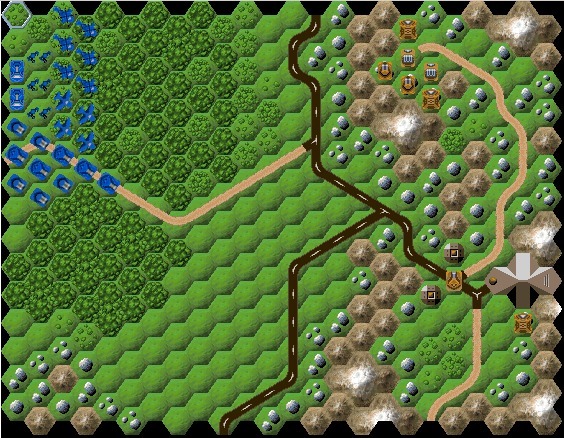 unit deployment in 'Uprising'. A close second in 'annoyances' are the 'neutral' buildings, especially the ones 'behind the front line' stuffed full of combat units = what General in his right mind would have just walked on past and ignored them ? Even when it looks as if each sides 'scouting forces', having decided to go cross country rather than follow the roads, are about to stumble across Depots etc. these forces have no Infantry with them, so can't capture anything anyway ! 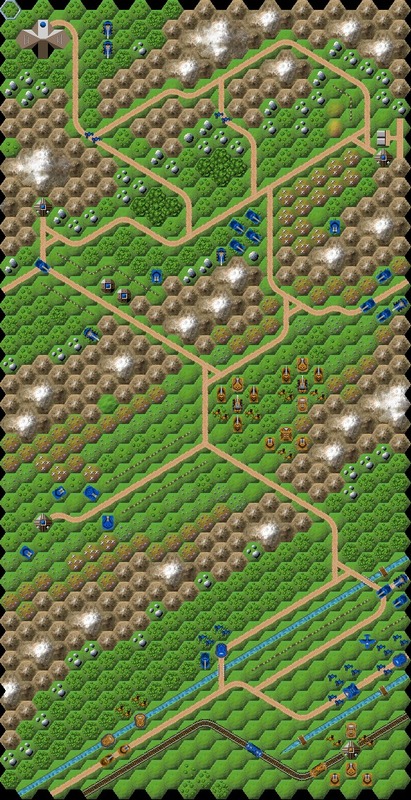 Further, whilst it's usually worth grabbing the contents of a 'neutral' building, most have no 'crystal generation' capability, so once the 'start up' crystals have been used, the building becomes a worthless liability not worth defending (which could explain why no General considers them worth capturing in the first place). Finally there are the 'forces committed to battle' = no-one sends in an Aircraft Carrier on it's own (i.e. without any support except Transport Ships :-) ) nor would any commander 'counter attack' a superior enemy - and especially not one with aircraft when your own forces lack anti-air capability ! If you don't like them, well in steves-x3en-Map-set.zip package I have included all the '.src' and all the tools I used to re-build them, so you can re-modify them to your own taste ! To allow tracks to give some movement advantage, I needed more 'steps' in the 'movement cost' values. This meant all the existing 'cost' values had to be increased - and then all Unit movement 'allowances' increased to compensate. The problem is, when a tile is 'occupied' it is (apparently) given a 'cost to enter' of 16. This was 'safe' in the original system since no unit have a movement allowance over 16 - however with the new movement costs and allowances, many units have an allowance over 16 ! Whilst this has the advantage that units can now move through a friend (asuming they have enough 'allowance' to enter the empty tile on the other side), the disadvantage is that units can also 'stop' on friends. When that happens, if the friend has a 'transport' capability 'all is well' (the friend is forced to carry the moving unit), but if not, crimson.exe simply crashes. 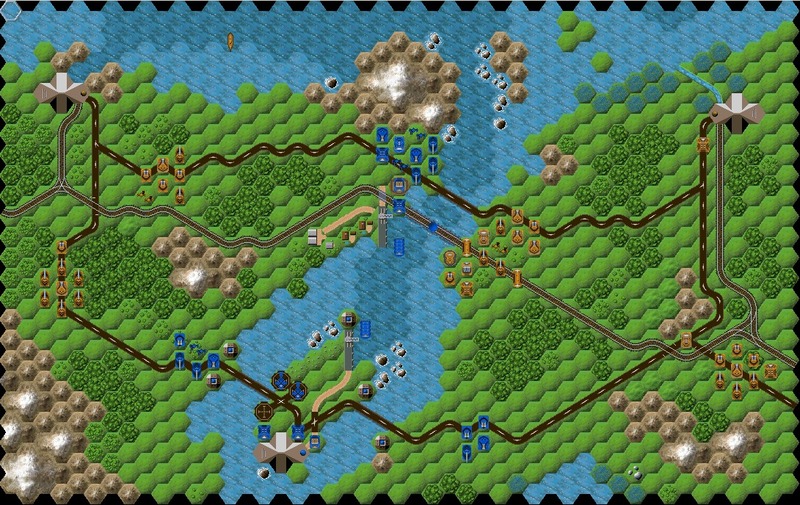 1) The streams are crossed by multiple bridges, most of which appear to have been built for no reason at all ! 2) The most forward group of FNA medium tanks (in the center) have no logical means of reaching that position, and especially not 'in advance' of the rest of their forces. The group of Empire Infantry who are 'outflanking' them (on the other side of the stream) also seemed to have appeared 'by magic'. After I re-routed some of the tracks to allow access to the FNA HQ, I added a line of 'tank traps' to the front and placed trenches behind both these and the river banks. I then repositioned the defending units into the trenches (where they might actually be of some use), although the trenches are mostly empty (of course). 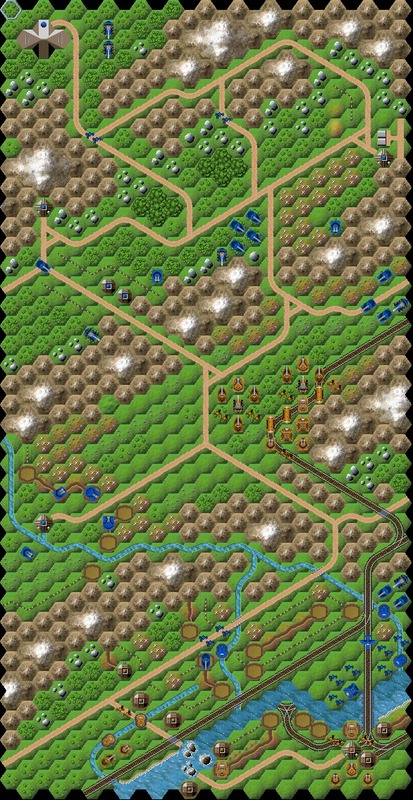 You can play either side, although (as usual) the AI is only really capable of 'attack attack attack' (as you will see later, eventually I had to force the AI to keep it's defending units in their trenches by defining a new Unit type = 'Garrison Intantry' that had zero movement capability). 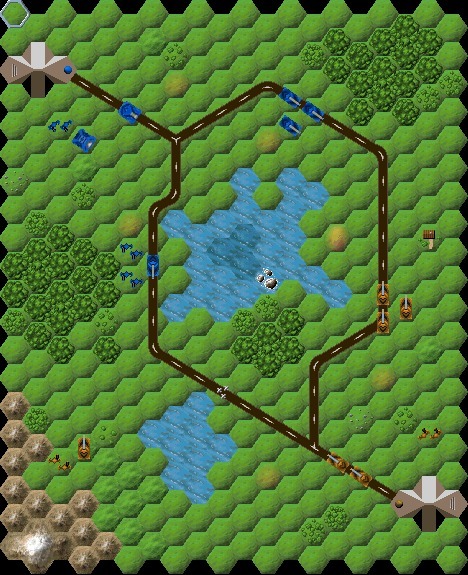 When I have time I'll add a human player 'handicap' to make it more challenging. 1) Roads join the buildings, however both the FNA and Empire 'advanced scouting forces' (next to the 'neutral' buildings) appear to have travelled cross-country to reach their current positions. Even more amazing, plainly each side decided to 'scout' only one of the two neutral buildings - and each chose a different one ! On the original map it looks as if, on discovering the enemy scouts, each side decided to send a second group by road to oppose them - but in each case these units 'got totally lost' and ended up advancing across open country and on the wrong side of the road ! 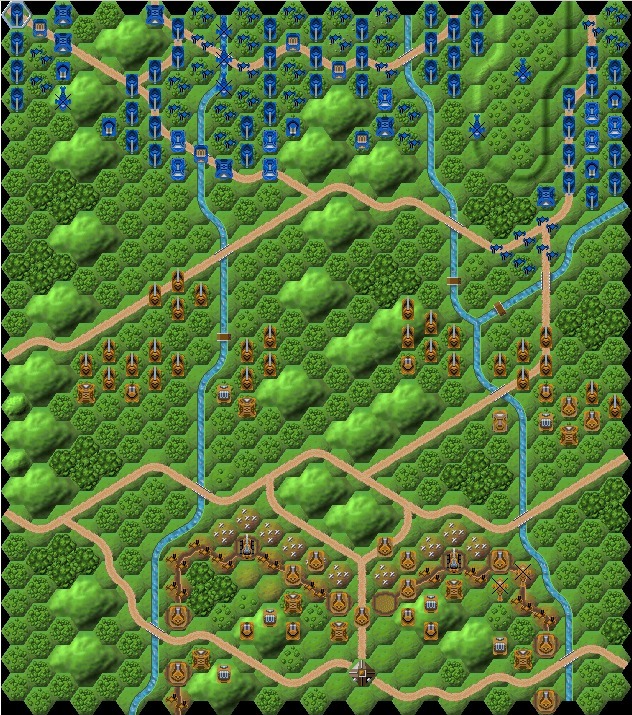 I added a single** new Infantry unit to each sides force groups. 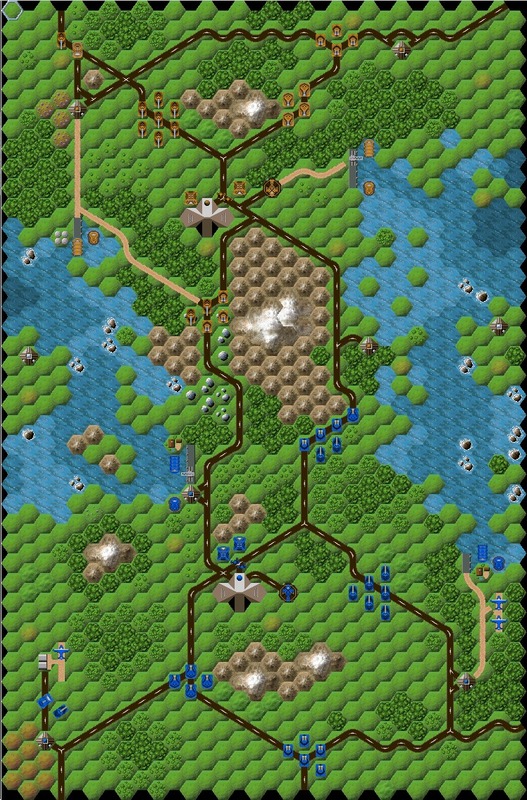 Adding a couple of troop trains (and an armoured train to protect them) is easy enough, as is moving the rail-guns to somewhere they can do some good. 3) For some insane reason the Empire military planners have placed lines of barbed wire behind the (badly positioned) trenches ! However, no matter where the barbed wire is, the trenches have glaring open flanks ! The ideal place for the HQ trenches is in front of the main road (a road to your rear makes it easier for you to rush re-inforcement units from one part of your trenches to another, where-as one to your front makes it easier for the enemy to rush units from one place to another). 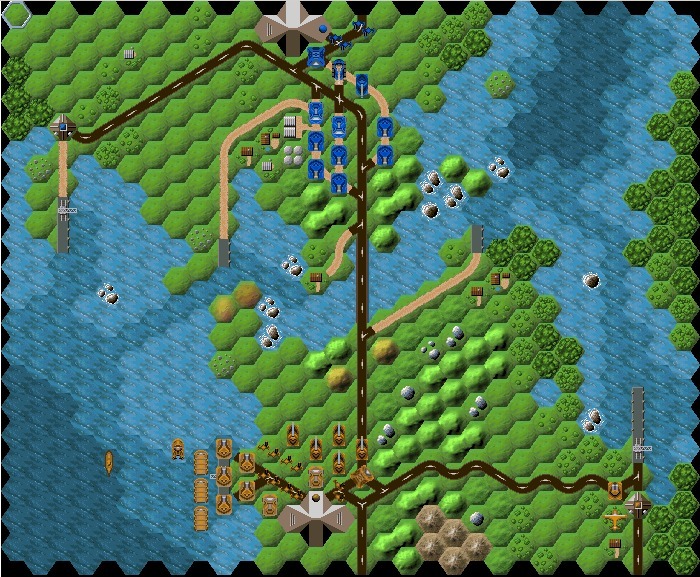 So, a total Empire defences / road / rail-line rework .. So, to 'fix' this obvious slip-up, all I needed to do was to shift the 'teleported force' to join the flank attack ..
.. and to 'explain' why they are not going straight for the Empire HQ I extended the river so they are obviously being 'forced' into a bottleneck at the road bridge .. Finally, given the Empire air superiority, the FNA would be stupid to attack without at least some Interceptors - whilst at the same time you have to ask "Where has the Empire's Bomber force got to ?" 1) Whilst the FNA factory on the northern island is working fine, they don't seem to have considered how to go about defending it. As for the southern island, they plainly forgot about that one completely (it's still neutral). On the other hand, perhaps they can't be bothered, since, of course, despite this being an island (and many of the Units in play being naval) the building has no 'access' to the sea .. 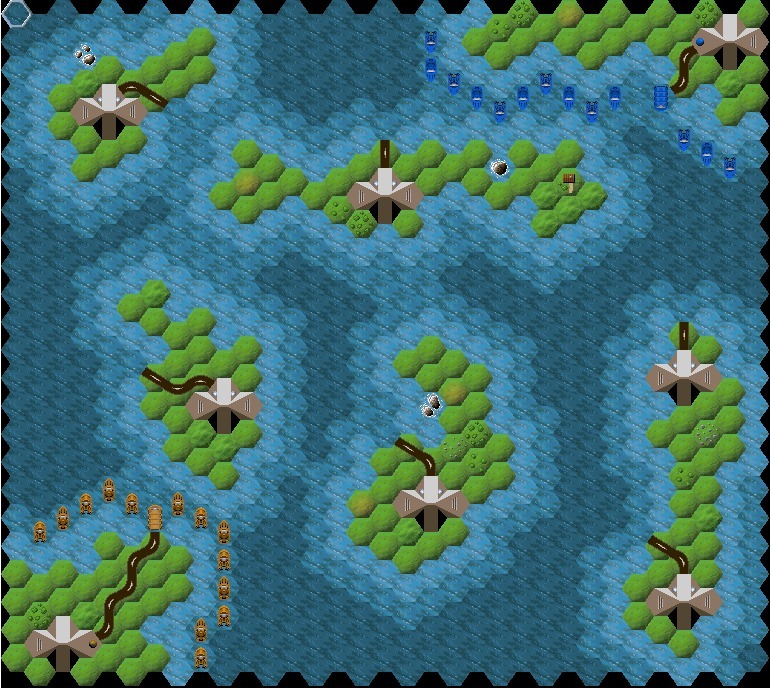 I also dumped the Hovercraft - these are just a distraction on what's supposed to be a sea/air battle. 2) Next we have the 'biggie' = the Empire is attacking with a few boats, some Troop Ships and an Aircraft Carrier ! At the very least the Aircraft Carrier should be protected by Submarines - and the Troop Ships should be defended by a complete screen of Boats (after all, who's to say the FNA don't have their own submarine - or even a few Bombers - hiding somewhere ?). 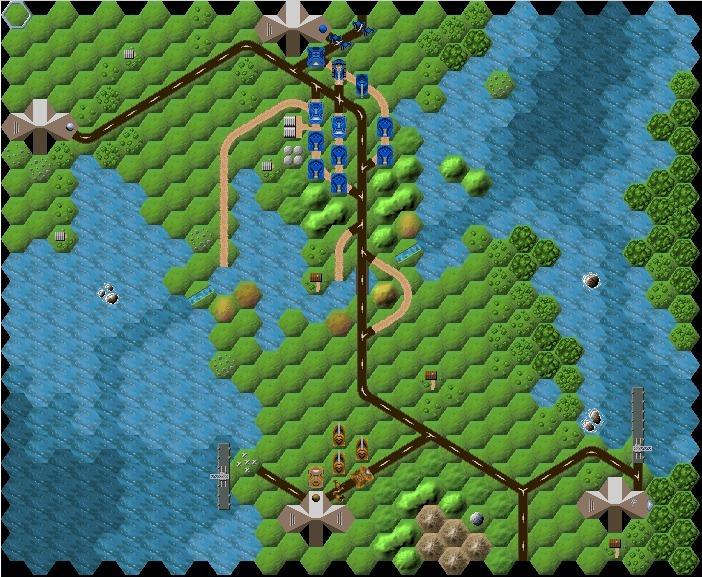 So, I added the necessary Carrier / Transport shipt 'screening' forces, changed some Shallowwater tiles to Water (to give the Empire some more choice in choosing their Troopship 'landing' place) and tweaked the FNA railway enough to make (almost) worth using. 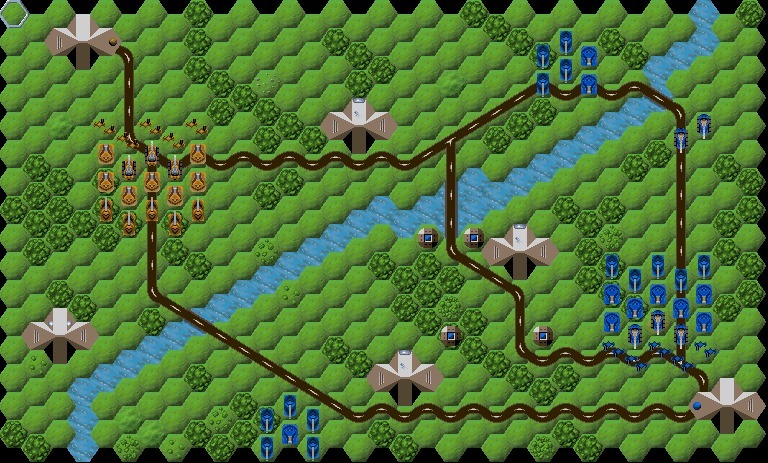 Whilst this appears an easy fix, there's the problem that your own naval units can't move through your own mines ! 4) Finally, I noted the Empire is sending in a couple of un-escorted Bombers with a Transport aircraft, no doubt as some sort of 'diversion'. 1) The 'plot line' is that the FNA 'special forces' have only just taken over an enemy building (to use as a 'temporary HQ'), so that explains the Empire 'Barracks' in the mountains to the FNA rear (which it looks like the FNA has managed to 'contain' by capturing the 'command post'). So far, so good, but it does beg the question of 'how' the FNA forces arrived (no Transport Aircraft, no access from the sea (so no Troopship) and no railway (so not by Troop-train either). OK, so they have a couple of Hovercraft (easy enough to add sufficiently more to pack all the troops in) = but what route did these take ? 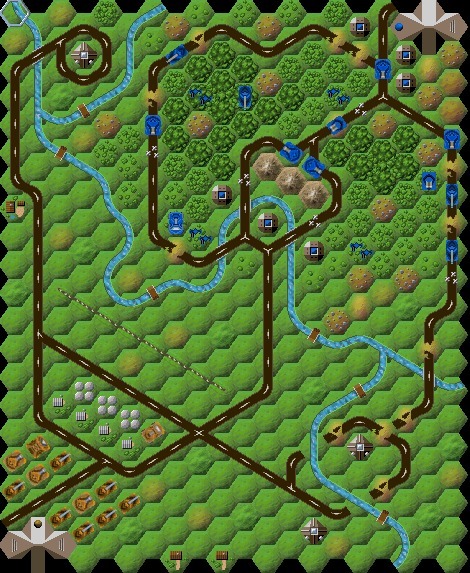 The northwest is out (since they would have grabbed the 'old factory' on the way), and the woods to the west are impassible to Hovercraft, as are the mountains to the south. OK we have the means = Hovercraft, and avenue of approach (from the southeast), but this still begs the question, why waste time 'capturing' anything (and throw away the element of surprise) instead of running straight onto the Airfield ? It possible the FNA forces where distracted by the need to destroy the Empire bunkers (there is no way to 'turn' Bunkers, so showing them on the map as FNA units is plainly an 'oversight', which I corrected by replacing them with craters), and then had to wait whilst their damaged units were repaired - and are only now 'getting ready' to launch their suprise attack. 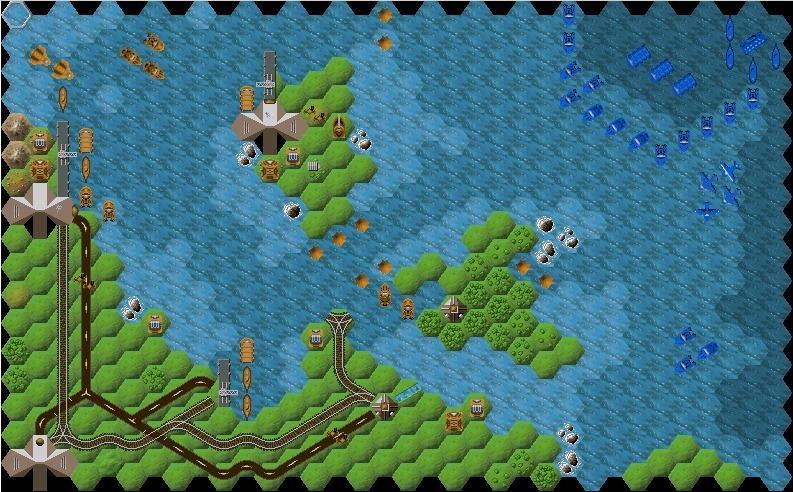 Indeed, the map is almost small enough to allow a 'rush attack' ... but ONLY if the FNA Hovercraft start the game 'loaded up', since on the Empire's own first turn they will 'launch' all their aircraft (even if only to 'hide' in their own buildings) after which the FNA will never catch them. SO, easy fix, just load up the Hovercraft with the FNA forces and let them go = but what are the 'special forces' ??? Well, they came to kill aircraft, so the Hovercraft must be loaded with AA-tanks (AA-guns take too long to setup and no other land unit has a better AA capability). 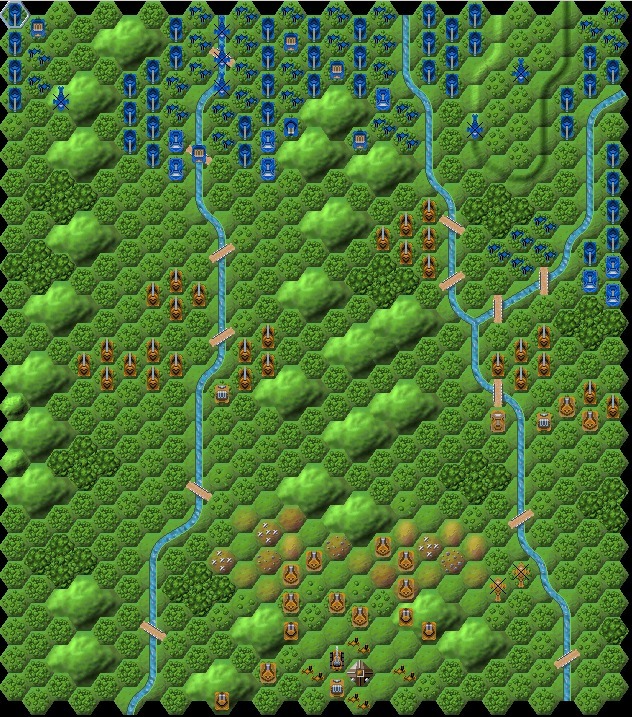 I started by moving the road so it's behind the defences - which allows the Empire to move it's troops (and Artillery) to support those in the trenches (and evacuate casualties back to HQ) instead of giving the FNA the road advantage. Of these defences create the problem for the FNA. Hovercraft can't cross Tank Traps, and AA-tanks can't cross either tank-traps or trenches, so how on earth could the FNA ever expect to make a successful attack ? The answer is to add a tarmac road route direct from the building just captured by the FNA to the airfield - and finally we have a reason for the FNA's decison to 'capture' this building = the fact that attacking up this access road is the only way they will stand a chance of catching the Empire aircraft on the ground. Finally, there's the Empire's inexplicable ignorance of the 'old factory' - after all, how dumb do your forces have to be to not follow the fork in the road outside your own HQ defences and take the nice straight track to the massive building complex that must be plainly visible in the distance ? Note: Clipped Wings is set up as a 'campaign' map. This is another map where the builders of the (northern) complexes apparently never considered the need to provide access to the sea 'next door' ... unlike the guys who built the Kekeelo island complex (which does have access to the river). On the other hand, since neither side has any boats, it's all a bit moot. Next up, is why are there 2 bridges over the River mouth ??? Of course - it's a just a mapping error - one must be a rail bridge ! 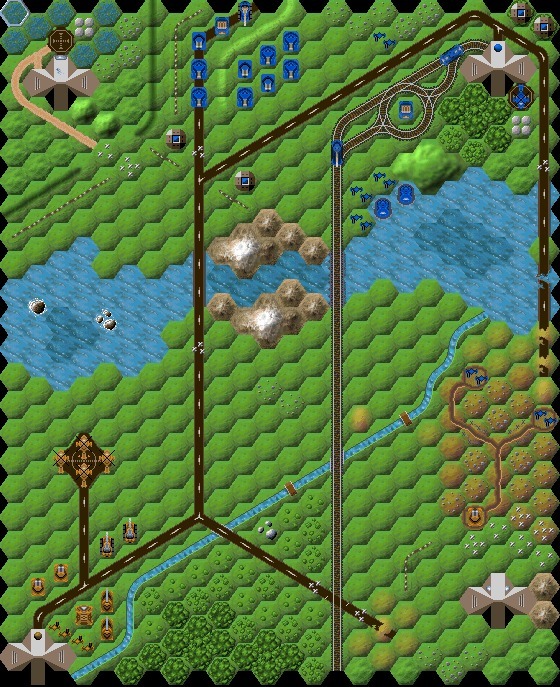 Since the units appear to be massing nearer the north-most bridge of the pair (and the southern is mined) I made the southern one the rail bridge. I also 're-aligned' the road a bit (tanks travel by road, where possible, so having groups of tank units 'just off the road' just doesn't happen without a good reason). The FNA group that has arrived at the rail-bridge must have just been unloaded from a couple of Trooptrains which have been blocked from moving any further by the Empire mining of the bridge. Whilst a river-side road or rail-track to the island 'fortress' could be added, in the end I decided Troopships would be more 'believable' answer (the 'docks' had to be on the island side of the bridges, as Troopships can't pass under bridges - although when Landing-craft are defined (later) this problem is resolved). Only a blind General could have 'overlooked' the 'neutral' buildings (both sides roads from HQ to the river go more-or-less straight past them ! ), so I've simply assigned two of the buildings to each side. I've never liked the 'mega structures' (which prevent access to the building from the rear and sides), so I've replaced the 'entrance' and added access to the river from one building on each side. Then I relaid the tarmac roads = if you are going to build roads that go past a major factory complex, you at least put in a 'spur' (how else did the construction units get on-site ?) and I replaced the "specially constructed outflanking road and bridge" with something I found a bit more realistic (track + ford). There is no point in giving the AI lots of crystals - all it ever does is build the most expensive unit it can afford (usually Artillery). After using up all it's start crystals, it then builds whatever it can afford as soon as it gets 'replenishment' crystals = usually Infantry (the cheapest). The AI has no concept of 'saving up' for something else, so it spends the rest of the game 'building' nothing but Infantry. ** You can give the AI a factory with no entrance. The human can't open the factory, so only usable by the AI. 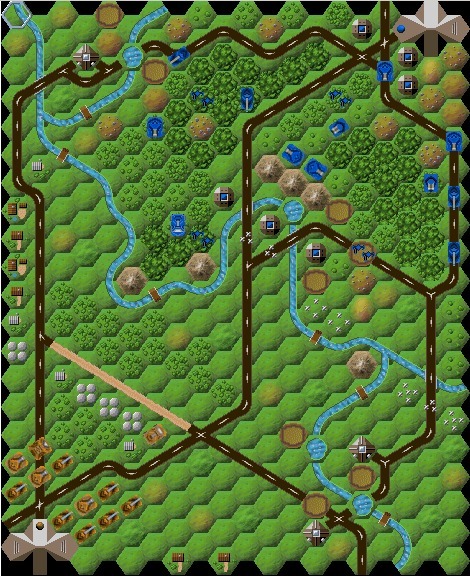 Setting up multiple such factories, each capable of building a single specific unit type and with a carefully set 'crystal rate' can then be used to provide the AI with 'reinforcements' (without using Events). However, if you do this (using CoMET) you CAN'T REBUILD FROM THE SOURCE (you get an 'error' when you try), however CoMET will 'save' to a .lev just fine. This is a decent sized map with a road system that's actually (mostly) 'believable' = except, perhaps, for the 'double road up the center' (why built two roads when a a single one would suffice ?). 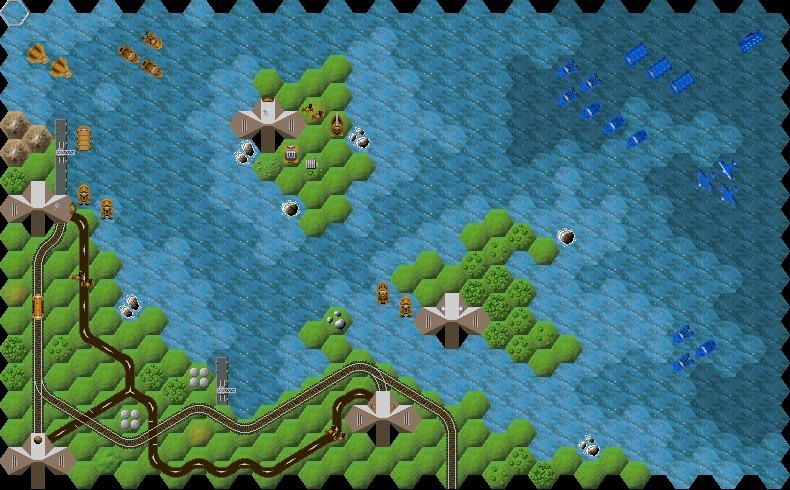 However, as usual, the island buildings have no sea access and the map is littered with 'neutral' buildings. The 'plot line' has it that the factories have been 'changing hands' = in which case why are they now 'neutral' (perhaps the last battle resulted in the complete destruction of both sides :-) ) ??? It's hard to believe the huge level of resources that have 'accumulated' in each of the factories - why haven't these already been used to build urgently needed units ?? I cut both factory resources down. One final note - it's possible for the FNA to get the "Congratulations , you have won" message (by capturing all the Empire HQ), however unless you have actually captured BOTH island buildings, the game will carry on ! So, rework the roads and assign the depots to the side that obviously 'owns' them. Buildings that are close enough to the water get access and docks, plus add in some boats and Transport ships (to explain how the FNA forces arrived where they are). 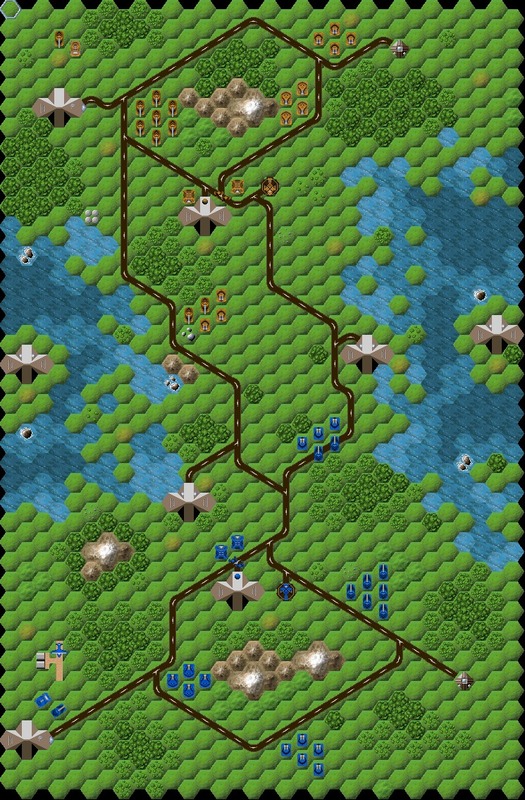 Finally, fix the bridge (so you CAN pass under it) ..
Well, the road builders really went to town on this map ! No wonder the FNA Infantry has become so confused that they had to leap out of their transport Hovercraft (on the south west edge of the map) in the middle of nowhere. 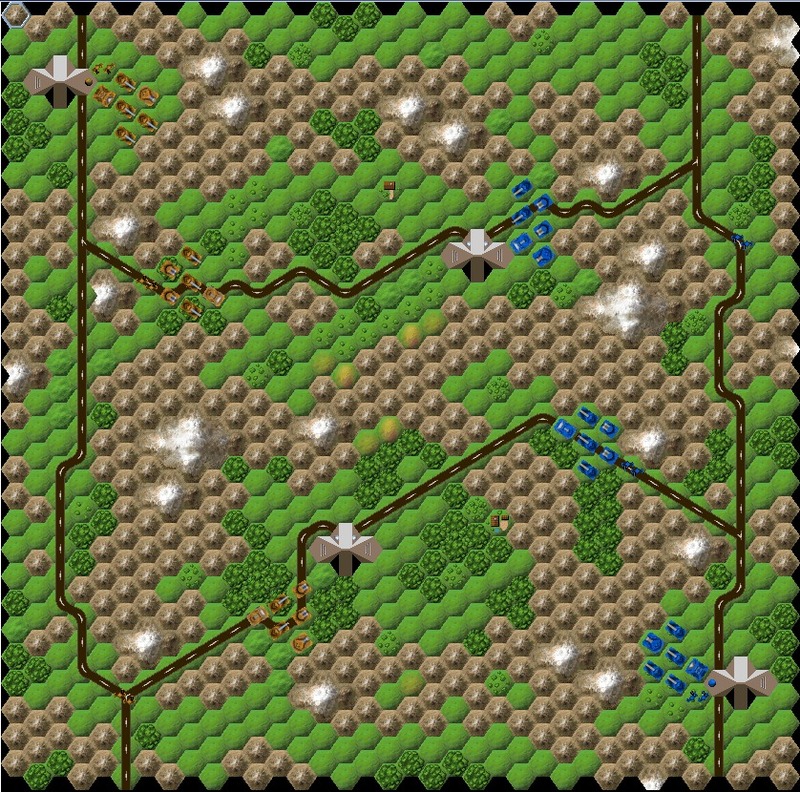 As usual, step 1 is to replace the 'mega structures' with single tile entrances. 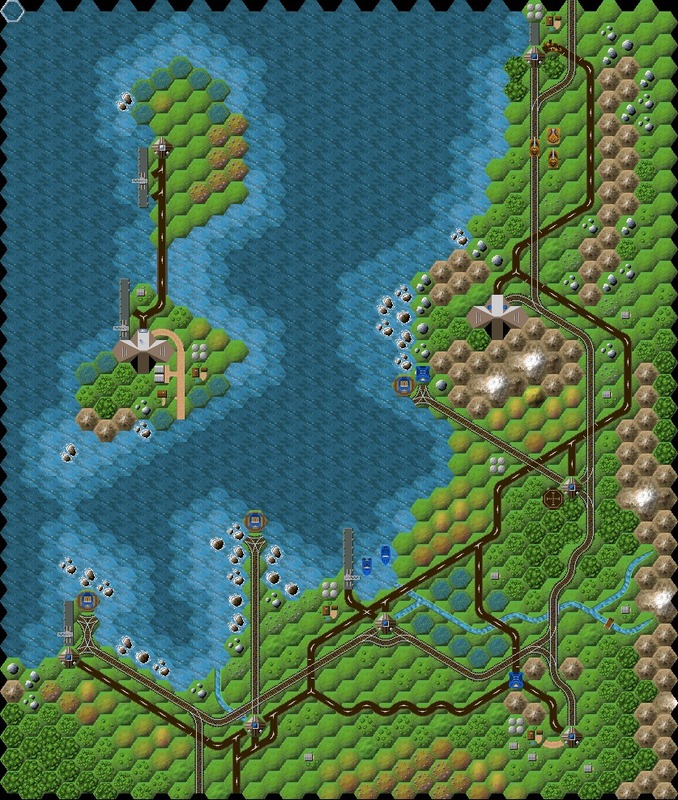 This then lets me tidy up the roads and add a railway linking all the land-side buildings. 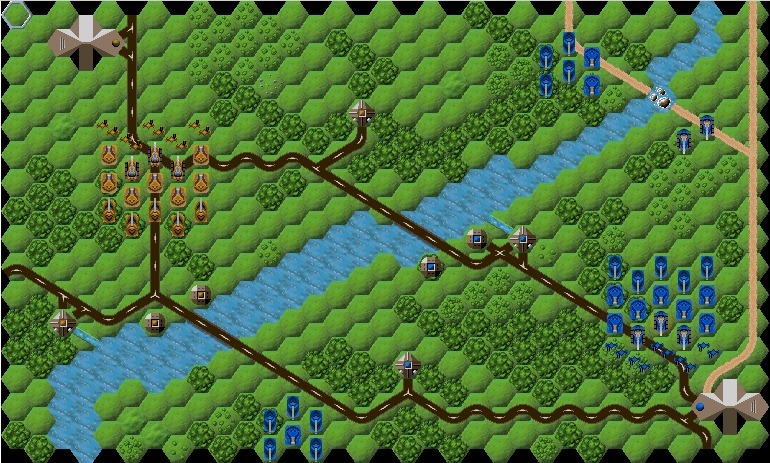 With the roads and railway in place, next I add some terrain to 'explain' the road/rail construction paths. One way to 'fix' this is to set up a 'handicap' Event so, if the human plays Empire, the FNA (AI) gets immediate control of the island factories and (say) 50 crystals per turn in each. However this doesn't really work either == the AI just builds (expensive) ground units in the Tank factory (like Artillery) and never works out how to move them to the 'mainland'. 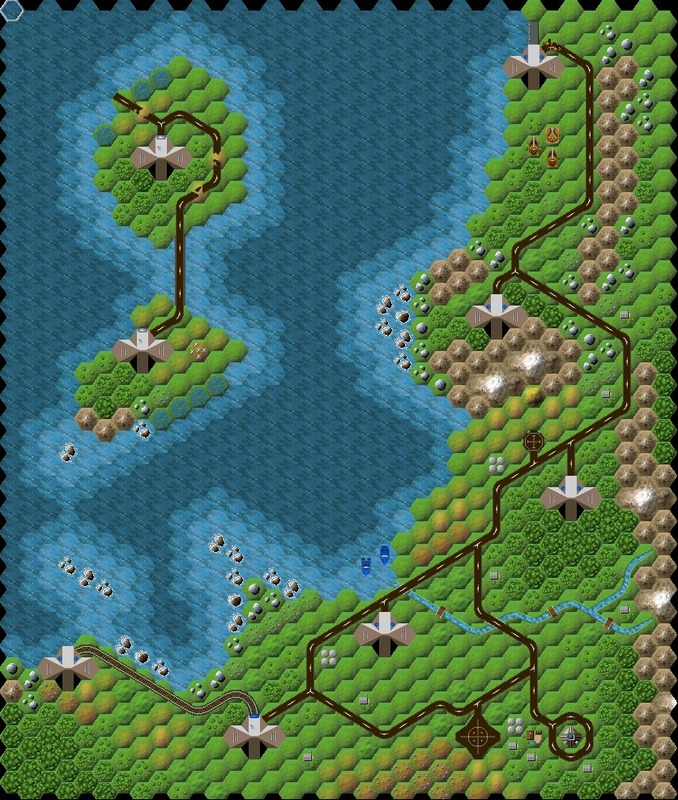 If the human player plays the Empire, it is necessary to 'force' the AI to build Troopships, Hovercraft and a mix of ground units - bit only when the AI is playing the FNA. 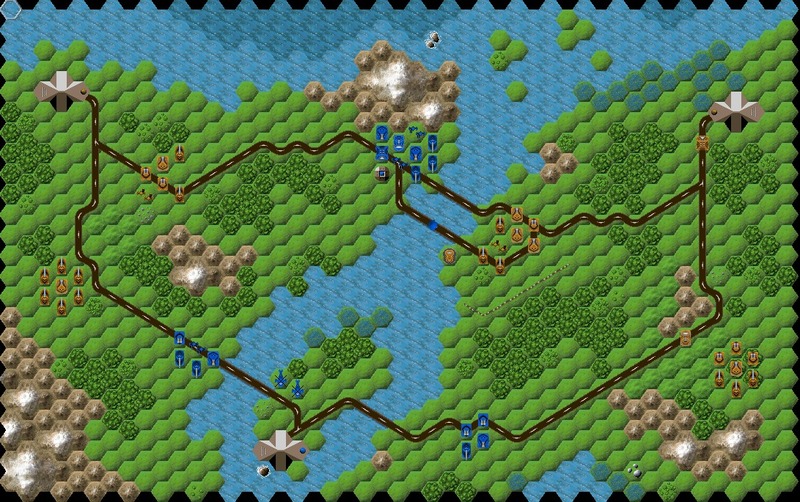 I achieved this by creating multiple 'Shop Factories' under the 'normal' (Marsh) Terrain tiles on the islands, setting each to build one unit type and a 'crystals per turn' rate that limited the actual build. Lacking entrances means a human player can't 'open' the building, so can't access the contents, but the AI has no problems. It's a rather funny 'defense' = no trenches, no wire, no tank traps, not even any mines = still at least the roads look like they are going 'somewhere' and the builders of the access road have employed a 'switch-back' approach that makes it quite defendable. The main problem for the FNA defence is that there is just not enough of them. This means even with the track allowing them to shift units from one side to the other, the defenders can't stop the attackers overwhhelming them. Both sides get APC's to carry their AA guns and I couldn't resist adding a couple of SPG to both sides. 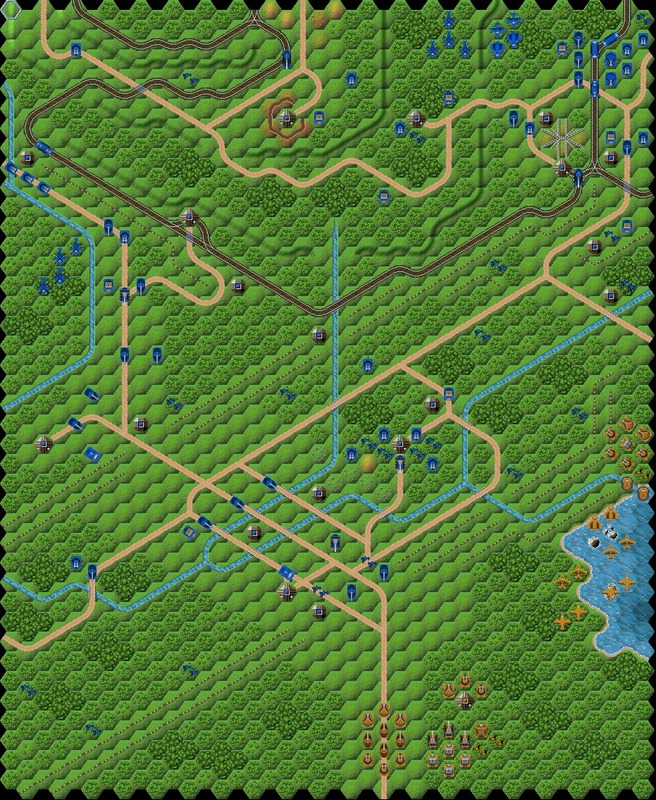 This is (quite) a good 'practice' map. In theory you can play either side, however the AI isn't really any good at defense, so in practice you have to play the FNA side. When I have time I'll add some 'Garrison' FNA units for the AI (and 'handicap' them away from the human player) to make it more possible for a human to play the attacker. The roads on the east side of the map are supposed to be 'damaged in combat', however it looks like the FNA just built trenches over the n-s river bridge road and the road from their HQ was never going to reach 'Womsch' anyway. 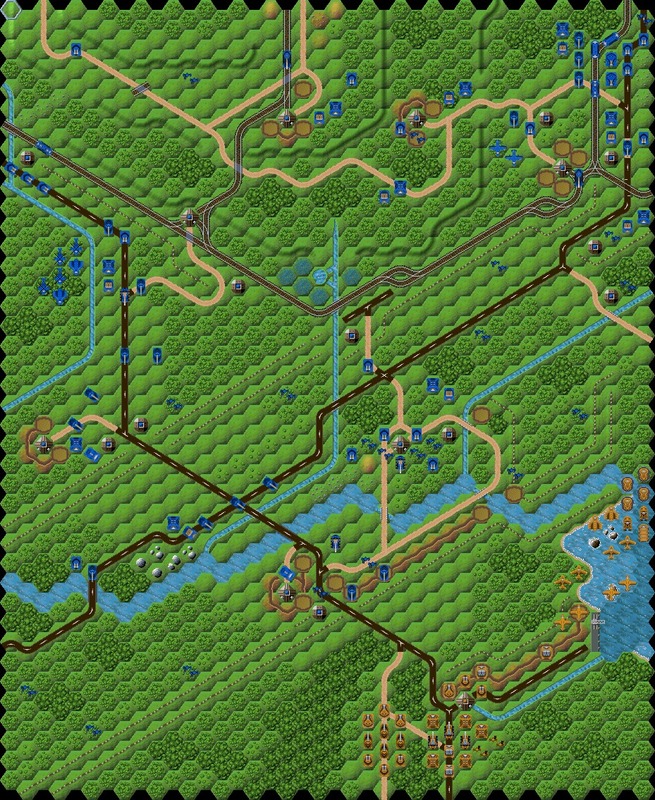 The rail line is also a bit of an issue. I have no problem with it starting at the Empire HQ (although a spur running off the north edge of the map to 'somewhere else' would make it more believable), but then it just runs straight down the middle of the map and off the south edge without going anywhere near either the FNA HQ or Womsch (a 'disputed' building) at all. Most of the tank-traps are poorly placed (the FNA to the east plainly decided the bigger threat was from their own rear as their tanks traps are positioned behind their own trenches, plus plainly the defense planners on both sides never expected any-one to notice they could simply 'walk around' the tank traps placed on the roads :-) ). 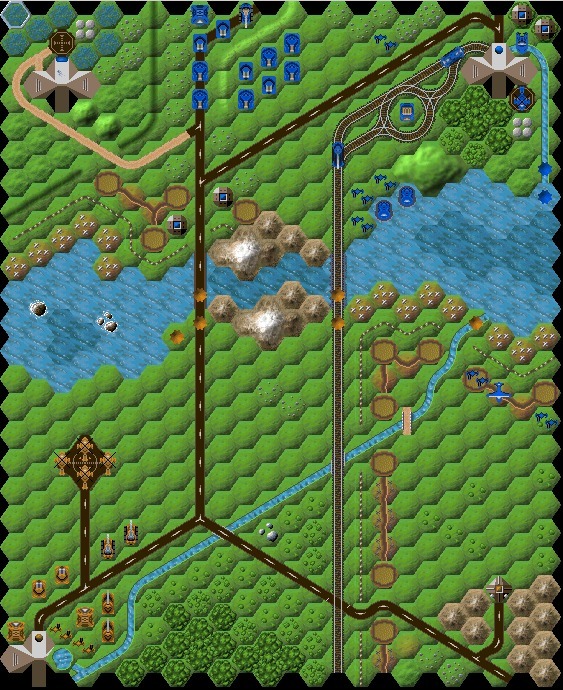 It's more logical if the rail goes past both HQ's, especially after I add some woods and extend the mountain range a bit to 'explain' it's path. 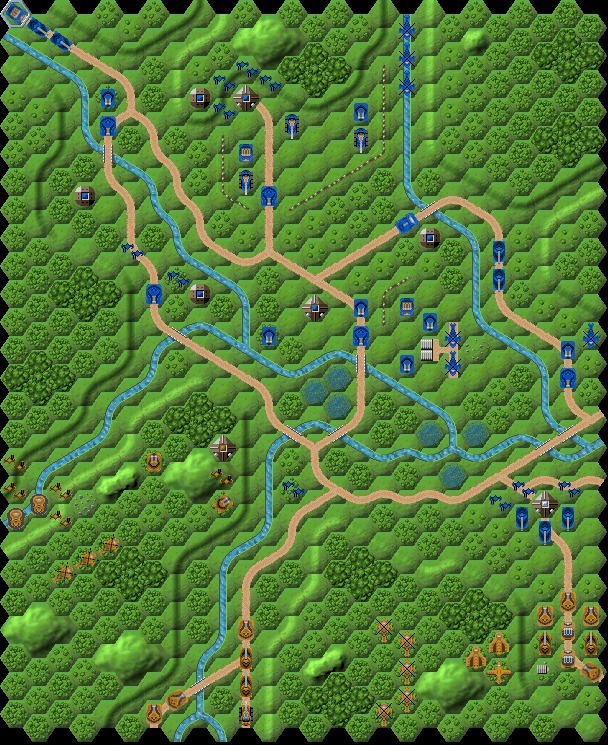 I then removed the far east bridge = it's just too near to the edge of the map for 'realism' - every combat map needs to be wide enough to allow 'outflanking' maneuvers. I also gave the Empire a canal so their HQ gets access to the river = it seemed fair, since the FNA have access down the stream (at least, they do after I removed the footbridge's that were preventing passage of Boats. Next are the 'impossibly neutral' buildings. Despite signs of conflict right in front of them, neither side seems to have bothered to occupy the actual buildings on 'their' side of the Gorge that they have (apparently) been fighting over !! Worse, neither side seems to have bothered building much in the way of defences (the FNA does seem to have dug some random trenches between 'their' building and the river, however these are so positioned that the FNA only has s single AA Tank 'maning the defences' !). First I assigned the building 'ownership' to the appropriate side. Then I sorted out the defences. Both sides get proper trenches, barbed wire and tanktraps extending along most of 'their' side of the river bank. Initially gave the Empire a transport aircraft (to the explain how the Empire infantry reached the FNA trenches), however the A.I. is quite incapable of recognising the threat posed by a human player using a transport aircraft to drop infantry right on top of it's (undefended) HQ ! The 3 small buildings are supposed to be 'outlying granaries', however two of them are connected by main roads (hardly 'outlying') and the 3rd is actually totally off the road (so grain lorries must have a cross-country capability :-) ). On the other hand, the 'direct route' between the two main building complexes (the rival HQs) is a simple track ! I decided that both the Empire and FNA 'main' tank forces must be moving along tarmac roads. 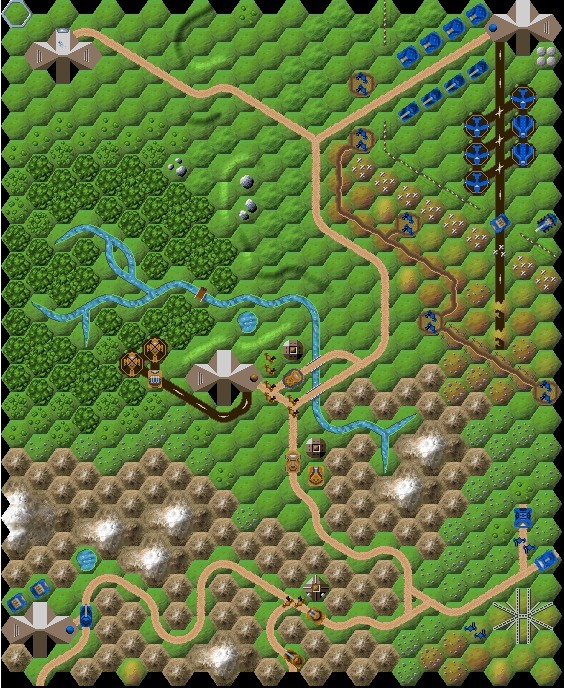 This means two tarmac roads between the HQ's - one across the center of the map (being used by the FNA) which exits the map to the north (and is thus linked to the northern Granery), and the other to the west (where the Empire forces are advancing) which is connected to the western 'Granary'. The eastern Grannery is now connected to both HQ's by dirt tracks (along which smaller Empire and FNA forces are advancing). 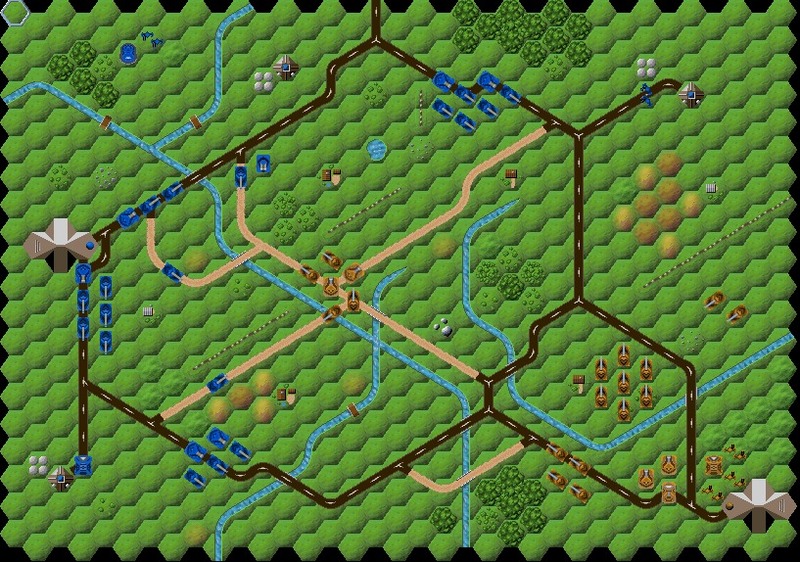 I actually re-routed the roads and tracks a bit so all the tank forces are moving 'on-road' (where possible) and I added terrain between the roads and tracks to 'explain' why they were built. Finally, if the 'granaries' are to be worth capturing / holding, then they must have some 'crystal production' value .. Note: Plowshares is set up as a 'campaign' map. Rather an odd map, with the FNA attacking in the center at the same time as Empire forces are attacking the FNA HQ. The FNA force is very badly positioned for an attack on the 'Jamming Station' - however if they were forced to deploy at that position after arriving by Troop-train along a railway line that doesn't get any closer to their 'target', then we have an explanation. Then we have to work out how the Empire forces arrived where they are. They do have a Transport plane but it seems they mostly arrived by Hovercraft, so I decided they must have followed a river / canal through the mountains. 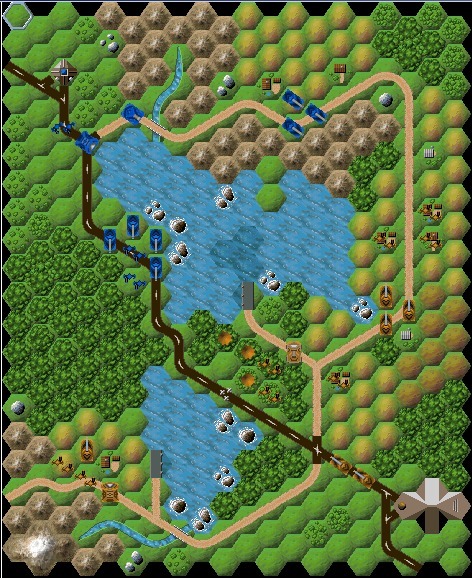 All I then had to do is arrange some very careful positioning of river, road, railway and mountain tiles to allow each of the two forces to have passed the other without detection. The stream in front of the FNA HQ must be a real river (else why not just Hovercraft across it ?? ), however to explain the splitting of the Empire attack (and the FNA's own Hovercraft forces), plainly there must be a 'ford' or bridge that needs protecting to the west, after which point the water becomes shallow enough to allow Hovercraft to cross. There is no direct route from south to north - the main path appears to be south-west to north-east - with lines of barbed wire following the same direction. I thus ran a tarmac road along this route with tracks off for 'obvious' reasons. The 'triple-double-bridge' was reduced to a single double .. Finally there was the railway - if Troop-trains where going to be of any use, then both 'passing-places' and a 'station' were required - also, whilst trains now run faster than tanks, the mega-switch-back to the final building negated the usefulness of the railway - so I fixed that as well. The FNA have launched what can only be a 'diversion' (from the lake in the east), although why they deployed from their Hovercraft is beyond me (since 2 lines of barbed wire form a 'bottleneck' and the terrain ahead of them will slow them down considerably, any sensible commander would have run the Hovercraft as far forward as possible before deploying their troops). 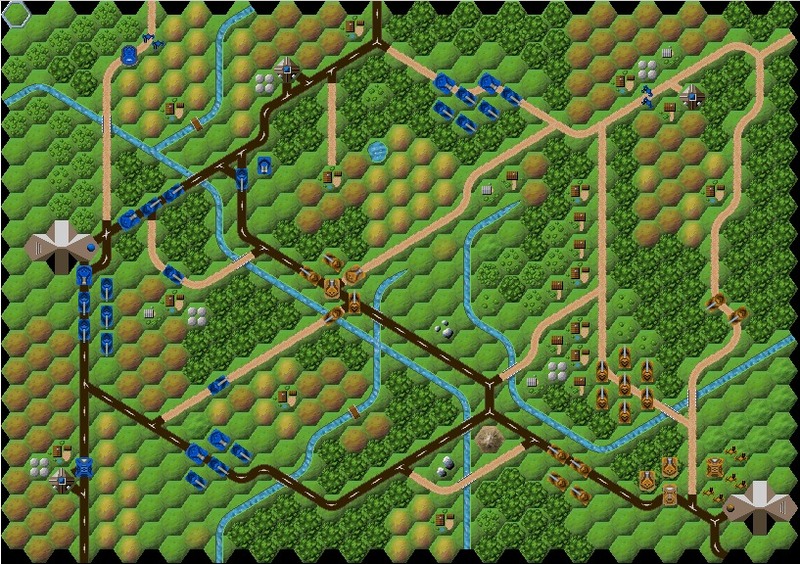 So, the slow moving units have to be on the main road (move the road), and the tanks on tracks. So, my first task is to arrange the 'ambush'. To have FNA units 'appear from no-where' would mean adding a building without an entrance, however only the AI can access buildings without entrances. 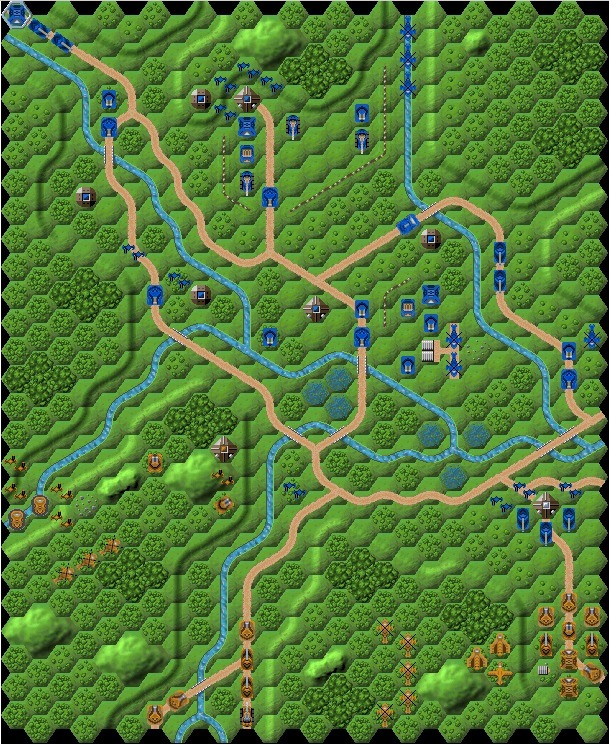 Since that would have forced the AI to play the rebels, I adopted the alternative approach of 'mining' the ground and adding an SPG 'hiding in the woods'. It's easy enough to add fames and mountains. I then further adjusted the terrain and roads so they look like they are 'going somewhere' other than just between the two buildings - down-grading the 'scenic route' to a track that visits farms etc. 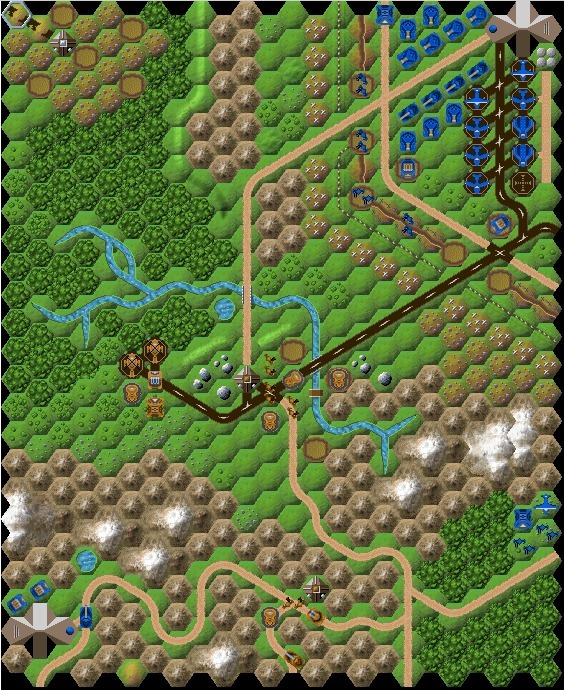 and takes the route it does because of woods/mountains etc. Also, I felt the Empire would grab most of the resources, so they get 5 crystals per turn at the Barracks and the Town onlt gets 3. The FNA have a Town HQ, the Empire only a nearby 'Barracks', however both are depicted with the same sized building ! So I changed the Barracks to a 'bunker' style entrance. This page last modified: 25th Jun 2017 03:20. Page Clicks to date: 1. User 54.90.86.231 @ ec2-54-90-86-231.compute-1.amazonaws.com.